Behold, there is a coming revolution in higher consciousness. A revolution driven by intellectualism and nurtured by active youth participation in the decision making process. The call of the revolutionists is to re-awaken the mindset of the youth and raise their level of consciousness almost akin to those that spurred the founding fathers into fighting for Nigeria’s independence. The call of the revolutionists is premised on the conviction that Nigerian youths are ready to take their rightful place in the process of nation-building and good governance. This is in consideration of the fact that the youth constitute a whooping 60% of the nation’s population. The need to equip the young generation with the tools of effective leadership has been the preoccupation of youth-driven organisations like Brain Builders International, the YouthHub Africa, etc. Recently, Brain Builders International in conjunction with the YouthHub Africa organised a ‘Youth Policy Dialogue’ on Friday 2nd June 2017 at the Kwara State Ministry of Youth and Sport Development, Ilorin, Kwara state. The dialogue was aimed at bringing individuals, profit and not-for-profit making organizations, student leaders, youth advocates, and other concerned stakeholders to the round table to discuss youth policies, its direct and indirect effects on the Nigerian youth and the nation at large. One of the objectives of the dialogue is to lobby policymakers in not only formulating youth-oriented policies but also providing the needed political will to implement and make them work. The dialogue had in attendance relevant stakeholders such as the Commissioner for Youth and Sport Development, Kwara state—Pham. Kale Ayo, CEO Heroes Nation—Mr. Mike Oladipo, renowned Constitutional Lawyer—Dr. Sambo, Senior Special Assistant to the Kwara state Governor on Youth Empowernmet—Mr. Saka Babatunde, CEO Positive Image Consult—Mr. Nadir Abdulqadir, CEO Prime Group—Mr. Tosin Olayanju. Others include: Mr. Wale Bakare, Miss Bibire Saadat of Saab Foundation, First Female President of Junior Chambers Int’l Kwara State—Mrs. Ibrahim Aishat Akaje, Olaogun Michael Sukanmi of Kids and Teens Resource Center/Success Focus Africa Initiative, current Vice President (Permanent Site) Student Union of the University of Ilorin—Miss Tohira Iromini, Miss Adelodun A. Shukurat of Hope for Girls and Women Foundation, Dammy Sunday Olaniyi of Dac Palm, among others. He went further to charge participants (composed largely of youths) to contribute actively to the discussion in order to achieve what he tagged growth and development. ‘The power of discourses like this cannot be overemphasized. It is my belief that the discussions today will be a precursor to interesting events and groundbreaking actions. So let us take on the transit bus of responsibility together by contributing maximally at every junction of this programme, so that at the end of the day, we may all arrive safely at the bus stop of growth and development,’ he said. The moderator and CEO of Heroes Nation, Mike Oladipo, also reiterated the ideals of the dialogue during his remark. At exactly 11:08am, participants were split into five groups with each group required to brainstorm over specific questions of national significance as contained in the tool kit provided by the organisers. The goal of forming these focused groups is to ensure active engagement of participants and generating homegrown solutions in the end. In return, intelligent answers are expected to be given to the questions assigned to each group, and reactions to be made by the special guests. The Honourable Commissioner for Youth and Sport Development, Pham. 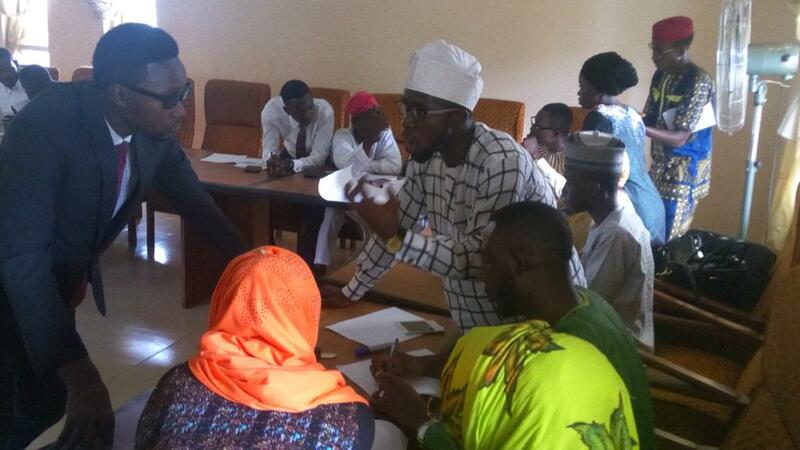 Kale Ayo, admonished participants to generate practical solutions to the challenges facing Nigerian youths. In the same vein, he sought to know if the participants were ready to key into the change mantra of the Federal Government. He rounded off his remark by suggesting that the organisers of the dialogue should embark on a national tour in order to get a holistic endorsement by the youth and that the result of such findings should be presented to the Presidency. The brainstorming sessions were intellectually stimulating, and the resolutions reached by each focused group were deeply thought out and pragmatic in nature. The first to react to the presentations was the SSA to the Kwara state Governor on Youth Empowerment, Mr Saka Babatunde. He advised the youths to change their orientation with a focus on the second stanza of the national anthem. He was of the opinion that the youth remain the greatest asset of a nation. In his words, ‘Youth continues to be the greatest asset for a nation’s development.’ He however upheld the view that the youth cannot be entrusted with the leadership of the country due largely to their lack of experience. The university don also pointed out the absence of provision for a youth objective under Chapter Two of the 1999 Constitution and suggested ways it could be incorporated and made justiciable if the government fails to deliver on its campaign promises for the youths. In a related development, the CEO of Positive Image Consult, Mr. Nasir AbdulQadir, gave a reverberating speech that sent chills down the spine of the participants. He gave a general admonishment to the youths to be alive to the current realities in the political landscape and take a positive steps in realising their dreams. In his remark, the representative of the Honourable Commissioner for Youth Kwara state charged the youths to demand for quality education as against quantitative education. He also charged the youths to be alive to their responsibility by constantly putting the government on its feet to implement youth policies that would engender growth and development of the youths in the nation. In his closing remark, the co-convener of the dialogue and CEO of Brain Builders Int’l, Mr. Olasupo Abideen Opeyemi, added his voice to the discourse of inexperience of the youth in leadership and governance. ‘Experience cannot be bought at the market, it’s gotten on field,” he said. He went further to state that if youths are entrusted with leadership position it will not only improve the economy and technology but also place on equal pedestals among the comity of states who uphold democratic values. Issues such as funding and godfatherism were also in the front burner. Mr. Olasupo thanked all and sundry for making the dialogue successful and result-oriented. He assured participants that such discussions will be held at regular intervals in order to intensify efforts in the campaign for youth inclusion in government. At this juncture, Miss Nurah of Brain Builders Int’l delivered the vote of thanks. The event ended at exactly 12:45pm with a group photo of the guests and the participants. The youth need to start acting.